SCR Director Candidates will be posting "blogs" and videos to this page during their campaigns. To stay up to speed on their goals, and ideas, keep checking back. VOTING: Each chapter will select a delegate to represent them at Forum 2017 in Dallas TX. Each chapter will cast 1 vote for their candidate of choice. The winner will be selected by majority vote. Be sure you let your chapter board of directors know your thoughts about who you want to represent the South Central Region for the next 2 years. Wow, wow, just: WOW! What an awesome and wonderful WIC Week you just completed. It was so much fun to see all of the social media posts about your events! I loved seeing all the group photos, and how you were involving the public, getting the word out about NAWIC. But, back to the purpose of this email. Jennifer VanBreda and I are vested in our Chapters AND South Central Region. We want you to know that no matter who is elected as your next South Central Region Director for 2017-2019, that the other is in full support, and will continue to be active at the Region level. To that end, this week, we are sharing our goals for SCR as your Region Director. Watch for another email soon from Jennifer. Really, all of these goals are intertwined. If we work together, promoting each other, and NAWIC, we will be successful. For more details about each of the goals, and my dreams for the Region, see the original email/post to the Region here. But it’s important to note, that my biggest goal is to serve you successfully. So, on Saturday, April 8th, I would appreciate your vote as the next South Central Region Director. Thank you. See you in Dallas next month! Hello SCR Ladies in the Dallas Chapter! As your Chapter meets to decide on your vote for the next Director of South Central Region, Jennifer VanBreda and I hope that everyone is well-informed about your Region Director Candidates. In an email distributed earlier this past week, Jennifer highlighted her qualifications. It’s amazing that our journeys have followed a similar path . I joined the Houston Chapter of NAWIC in 2003. I attended meetings of the Houston Chapter, whenever I traveled to Houston for work, although I lived in San Antonio at the time. In the summer of 2008, when I moved to Houston, I started attending all Chapter and Board meetings. In 2009, I was elected to the Board as a Chapter Director. Since then I have served as Treasurer (3 times), President, Recording Secretary and Director, all with the Houston Chapter. I’m thankful that our National and Regional leaders over the years have provided me with additional opportunities to serve our organization. I’ve served as Regional PR/Marketing Chair, as well as Region Event (Forum and AFC) Recording Secretary, Region Event Minutes Audit Committee, and Region Fund Trustee. This past year and this year, I’ve been serving on the National level with the PR/Marketing committee. Each of these positions provided wonderful learning and service opportunities for all facets of our organization. I believe in my heart of hearts, that the efforts of my service in each of these areas have provided successes that benefit NAWIC at each level (Chapter, Region and National) of our organization. I hope to continue that service as your 2017-2019 SCR Director. As Jennifer mentioned in her email, we are both in this campaign to support each other, and we each will continue to support whoever wins the election. Please reach out to me if you have any specific questions about my experiences or my vision for our Region, or any concerns you may have about our Region. Looking forward to seeing you in Dallas at Forum! Hello Lovely Ladies of South Central Region! I hope that everyone has recovered from the holidays, and had a successful start to the New Year! It’s hard to believe how fast time flies these days. Can you believe that January is already gone? We are just a couple of months away from our 2017 SCR Forum, scheduled for April 7-8 in Dallas at the Hilton Lincoln Centre. As you may know, this is the year that we will elect a new Director. There are two of us running for the position, myself and Jennifer VanBreda from the Dallas Chapter. Over the new few weeks, Jennifer and I will be sharing information with you each week: about the election process, about our goals for NAWIC SCR, and about us! Be on the lookout for our emails, and posts on the SCR Facebook page. We’ll also be posting links to these messages on the SCR Website. The purpose of this email is to provide you some basic information about the election process. Each Chapter will cast one vote during the business meeting held on April 8. Your delegate and an alternate should be elected by your Chapter no later than March 9 by the Chapter membership, not the Board of Directors. As a Chapter, you need to decide which candidate will receive your Chapter’s vote. Later this week, watch for an email from Jennifer with additional information about the voting process. Until next week, have a great day! Campaigning around WIC Week has been awesome!! Every chapter was so active, posting constantly on social media. Its great seeing everyone use every avenue possible to promote NAWIC. 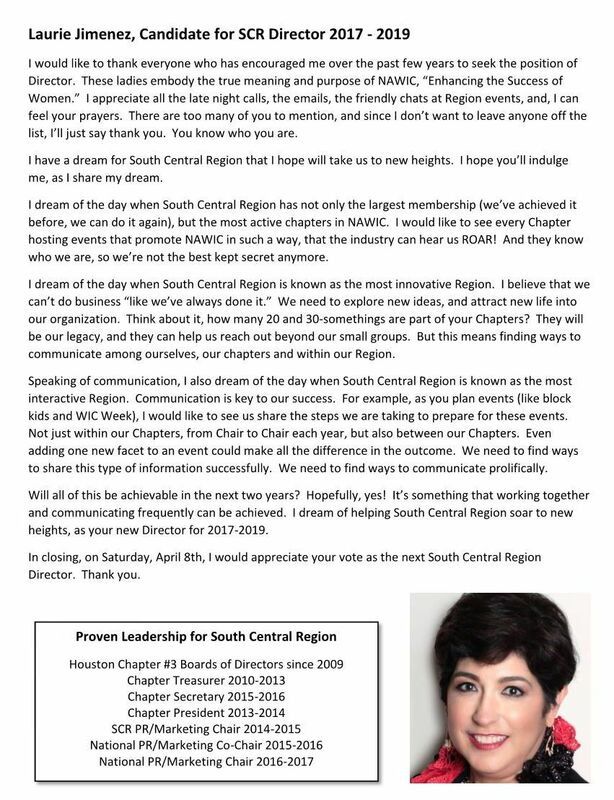 One last email from me about what my goals for the South Central Region of NAWIC are if I am elected. The basics of course, grow the membership, get more information out to the industry about NAWIC, more activities within the chapters and the Region for the communities and our own benefits of networking and education. My main goal …. I want NAWIC to be everyone’s first choice, the “GO-TO”, for their female employees to join over any other organization. This means we have some work to do. We need to grow our foot print, we need to have exciting speakers, offer education seminars for others, not just NAWIC members, get out in the community and the industry and show our the value of NAWIC, share ideas between chapters and become one powerful region united together to make NAWIC the “GO-TO” for everything construction. Every chapter has already voted for their chapter delegate to represent them at Forum and cast the one single ballot for your new South Central Region Director. Some chapters have already decided who the vote will be cast for and others have not. No matter whom you cast your ballot for, you will be electing a strong woman to represent you at the National level. Both myself and Laurie have agreed to support each other to make this region stronger, and to help the chapters in anyway needed. Someone will hold the title, host the Regional events, and visit all the chapters, the other will be waiting in the wings to help her out in any way needed. Many of you have elected your chapter delegate to vote at Forum. Some chapters have not decided on who that delegate will cast their one chapter vote for. I know you have been watching the South Central Region Facebook pages and watching the videos from both candidates. Now I want to take a minute to talk about myself and my qualifications for the position of Director. I started in NAWIC in March of 2008, and jumped right in and ran for a board position and was installed in October 2008. I have only been off the chapter board of directors during the time when I left California to move to Texas. I have served at a chapter level and as various regional committee chairs in 2 regions. My entire line up of positions held is on the SCR Website on the candidate’s page. I ran for a board position and volunteered to serve at a regional level because I want to help NAWIC make a difference in the construction industry. I believe serving within two regions and for two different chapters, I can bring a unique twist to our thought process as a region. Sharing ideas and processes between chapters and regions makes us all stronger. NAWIC has always been a huge passion of mine. Sharing my love for the construction industry keeps me involved in NAWIC. Great meeting speakers, all the NEF events, Block Kids, CAD Drafting, and of course NFSF and our scholarships, are all items I promote daily in my work and personal life. You all have a difficult decision to make, Jennifer VanBreda or Laurie Jimenez. Whomever you choose, the South Central Region will be in good hands. We both have different strengths, but have decided together that we will each support the winner to help keep NAWIC strong. If you have any questions for me directly about what my goals, strengths or plans are, please reach out to me anytime. I look forward to seeing most of you at Forum in April. Running for Director is a task. With all voting being done at Forum this year, each chapter must choose their candidate of choice before we even arrive in Dallas for Forum. With that being said, both Director candidates have been researching and verifying and re-reading the NAWIC Operations Manual so we can help you understand the voting protocol. If you have any questions, feel free to reach out to me, Laurie Jimenez, Director Dena, or any National Officer within our Region.